The IEEE NPSS Igor Alexeff Outstanding Student in Plasma Science Award has been won by Guy Rosenzweig. The 3rd Spectral Line Shapes in Plasmas code comparison workshop to be held in Marseille, France, March 2-6, 2015. Special Issue "Spectral Line Shapes in Plasmas"
The Special Issue "Spectral Line Shapes in Plasmas" is now complete and has been published. Lately, a clear trend in the development and applications of line-broadening calculations is a significant increase in the computational results, in particular, using computer simulations . Computer simulation is the discipline of designing an abstract model of an actual physical system, executing the model on a computer, and analyzing the execution output. The scale of models being simulated by computer simulations today far exceeds anything possible (or perhaps even imaginable) using traditional paper-and-pencil mathematical modeling. The calculations  are split into two largely independent computational pieces. The first one is the molecular-dynamics N-body simulation that models the motion of plasma particles. The fields produced at the radiators, as a result of the essentially chaotic motion of the plasma particles modeled, are stored as a function of time for a subsequent use in the second computational piece. The latter piece treats these "field histories'' as a time-dependent perturbating potential while solving the Schrödinger equation for a radiating atom. The method is rather unique in its universality and in the broad scope of effects included, naturally accounting for all frequency regions of the plasma-particle fields and for the effects of the particle interactions, being applicable to line-shape calculations of isolated and overlapping spectral lines involving both dipole-allowed and dipole-forbidden radiative transitions under a simultaneous influence of externally-applied (constant or time-dependent) electric and magnetic fields in both weakly and strongly coupled plasmas. 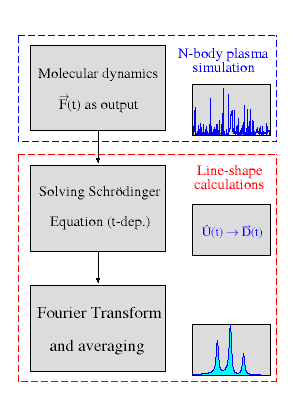 The method has been used for benchmarking competing Stark-broadening theories , analyzing the influence of the correlations effects on the line shapes in plasmas [2,4], spectroscopic analysis of radiation-heated foams [5,6], state-of-the-art accurate atomic-data measurements , and 3D-mapping of fluctuating electric fields in pulsed plasmas .